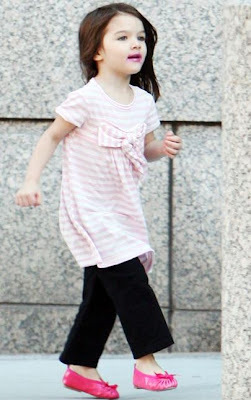 Suri & Katie were spotted out for an afternoon stroll in Boston on Tuesday, 29. With Tom working on the set of “Wichita,” Katie and Suri popped on over to DeLuca’s Market to do a little grocery shopping and to Crate & Barrel for more shopping :), before continuing about with the day’s errands. 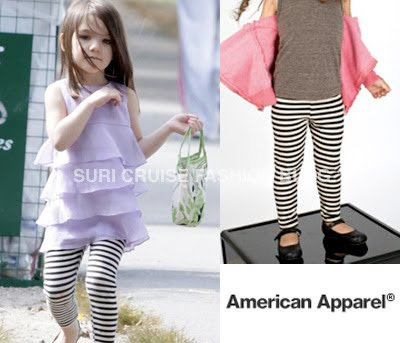 Suri is wearing Printed Cotton Spandex Jersey Legging in Crème/Black by American Apparel. Suri accessorized her outfit with Leaf Pint bag from Rainforest Collection by GAP. Katie is carrying Suri's monkey - The Monkey is Dallas Cowboys NFL Large 27'' Pink Rally Monkey (collectible item). Suri was wearing Lavender Tiered Dress by Crazy8 and Leopard Shoes by Crewcuts. Suri & Katie snapped while boarding their private jet on the way to Boston on Thursday, 17. 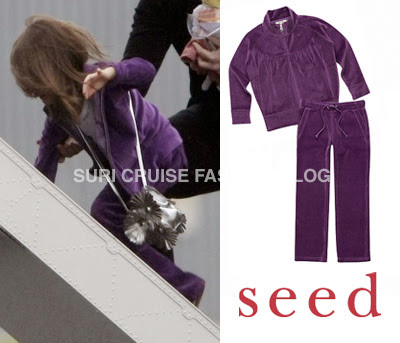 Suri is wearing Velour Zip-Up Jacket with Track Pant and Multi Sequin-trim Tank in White, all by SEED (Australian brand). 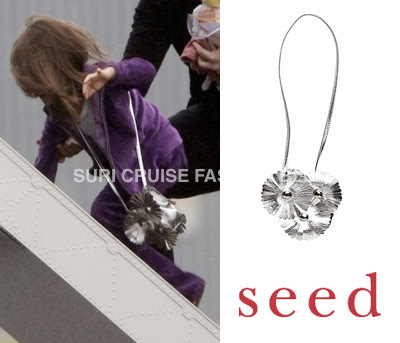 Suri accessorised her outfit with Silver Flower Power Bag also by SEED. 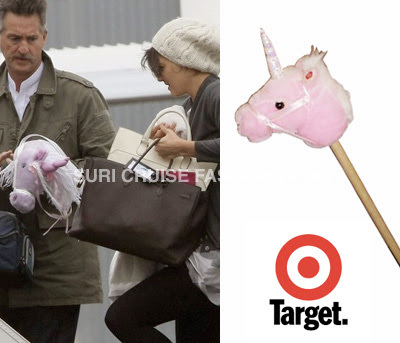 Katie's bodygard was seen carrying Pink Unicorn on a stick from Target Australia (in-store only). L.A.'s fashion set gathered at Maxfield in West Hollywood on Thursday night to get a first look at Katie Holmes and stylist Jeanne Yang's premium designer line Holmes & Yang. "I've been nervous all day, but I'm really excited," said Holmes of the debut, which includes a women's and girls' collection. "We just wanted to do comfortable clothes that you can wear going from a meeting to being a mom to going on a date." Mission accomplished. The collection, done in a palette of cream, navy, and black, features luxe shirts and trousers; textured silk jumpsuits; motorcycle jackets; leather, silk-lined blazers; and ruched strapless dresses worthy of the red carpet. "Everything's lined in silk, and we really spared no expense," added Yang, who first bonded with Holmes, fashion-wise, over a pair of pants. "I'm thrilled because things came out even better than I expected." Holmes' hubby, Tom Cruise, is currently on the East Coast filming Wichita, but the actress had plenty of supporters on hand. Guests such as Crystal Lourd, Sofia Vergara, Magda Berliner, and Raven Kauffman sipped Perrier-Jouët and nibbled on creative hors d'oeuvres (corn soup in an eggshell, anyone?) while perusing the new line, which will be sold exclusively at Maxfield for the fall season. "I'm here to support other people creating," said Alanis Morissette, who is venturing into the business with a recyclable denim line while also writing a book. "Fashion is just another form of expression for me." Guests were also charmed by Holmes & Yang's pint-sized offerings. 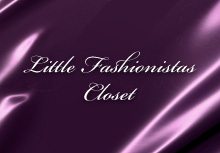 "Jeanne's girls and my daughter have a point of view of what they want to wear," added Holmes. "I'm constantly amazed by all the colors and layers that Suri will put together." Determined to go beyond kids' T-shirts and leggings, Yang succinctly explained a key design element: "It has to twirl." Suri is carriend around by Tom on the set of his new movie Wichita on Tuesday, 22. Suri is wearing her dance clothes & shoes. After spending some time with Tom Cruise on the set of “Wichita”, Suri and Katie boarded a plane outside of Boston. Cruise Family arrived in Boston on Friday, 18 and in the evening they went out for dinner at Abe & Louie’s on Boylston Street. Suri is wearing Heart Print Dress in Deep Plum by Little Marc Jacobs. 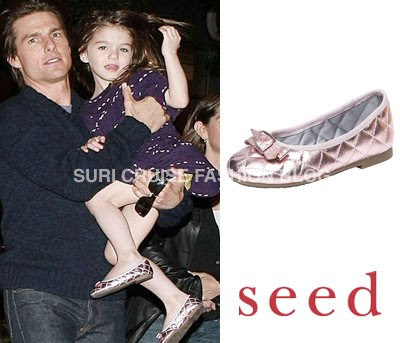 Suri is wearing Purple Quilted Bow Shoes from FW'09 by SEED. Suri stepped out in a pair of silver high heels while walking along Newbury Street with mom Katie on Monday, 21 in Boston. Suri also carried around a handbag and a stuffed animal of Queen Celeste (from the Babar the Elephant book and TV series). So cute! 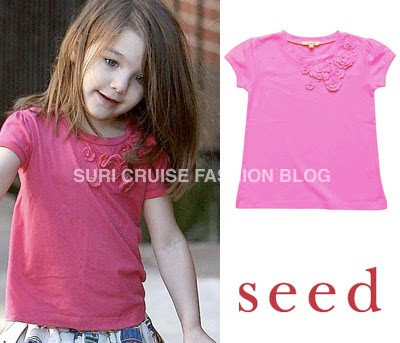 Suri is wearing Flower Trim Tee in Fuchsia by SEED (Australian Brand). in the afternoon Suri & Katie were spotted leaving CafeTeria and shopping at The Fairy Shop. Suri is wearing Pink Canvas Sandshoe by Walnut, this color will be available on-line from October 1st. and her newly purchased unicorn is Sunbeam Unicorn by Douglas Toys. Suri & Katie spotted out & about in Boston on Sunday, 20. Katie carried around a cute Hello Kitty bag. Suri is wearing Jersey Bow Dress in Pink/White Stripes and Linen Culottes in Black, both by Tiddles & Chich (Australian Brand). Suri's outfit is completed by ZOE Pink Ballerinas by Maloles Petite, which she first wore while shopping at the Grove on May 31st 2009. 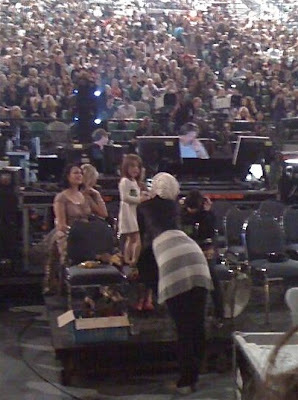 Suri & Katie attended Beyonce's opening concert in Australia on Tuesday, 15th. After her final day of filming on horror/thriller Don't Be Afraid Of The Dark, Hollywood A-lister Katie Holmes took her tot along to see the superstar's show, Suri's first concert, at Rod Laver Arena in Melbourne. The star mum and daughter decided against hiding away in a private box and instead sat in a roped-off area in the general admission part of the arena, and happily posed for pictures with thrilled young fans. But Confidential's southern spies report that things did not go to plan when the show got under way, with Suri unimpressed by Beyonce's dazzling opening number, Crazy In Love. She put her hands over her ears and turned her head into her mum's shoulder to hide from the flashing lights. Holmes and Suri left the arena after the track, but returned later with Suri wearing industrial earmuffs. The pair are expected to leave Australia after a 2½ month stay and return home to New York this weekend. It is understood Holmes will spend the rest of the week attending to post-production commitments on the film. reported by Herald Sun AU. 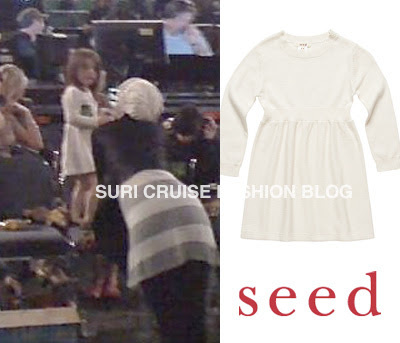 Suri wore this Fine Knit Dress in Vanilla from FW'09 collection by SEED. YAY!!! Suri & Katie are heading home!!!! Katie’s time in Melbourne, Australia is coming to an end. She’s been there since the beginning of July filming her latest movie “Don’t Be Afraid of the Dark”. Word on the street is that Tom Cruise will fly into Melbourne sometime this week and then they will both, along with daughter Suri Cruise, fly back to Los Angeles. A special party is planned for Katie and will be attended by her co-stars Guy Pearce and Bailee Madison. Tom & Katie were on the run in Melbourne yesterday, donning matching outfits to go for a midday jog in the Botanic Gardens. Fellow runners noted the celebrity couple looked fantastic and were perfectly in sync as they jogged a lap of the gardens. The actors then headed back to their palatial digs at Crown Towers and changed before heading out to catch a matinee performance of Slava's Snowshow at the Athenaeum Theatre on Collins St. The family, with Cruise carrying his daughter Suri and Katie armed with her daughter's little make-up bag and toys, arrived through the theatre's back entrance around 2pm. However, they left less than an hour into the show, well before the final curtain. No reason was given for the stars' unexpected departure. Cruise Family have been enthusiastic supporters of Melbourne's theatre scene while in town.